Hello and welcome! I’m so glad that you’re here, whether you’re coming from my fabulous friend Kara’s Party Ideas or whether you’re one of my regular guests! I hope you’re mouth is watering because we have eight, yes EIGHT treats in store for you today! As part of our “Favorite Christmas Desserts” tour, I’m sharing my Cream Puffs with Cranberry-Orange Sauce with you today. This is not just any cream puff recipe. It is served with a vanilla cream and drizzled with a cranberry-orange sauce that is divine. I actually refer to it as my “Christmas Cream Puff Recipe” to my family. It’s one of our favorites. Christmas is always a time of baking and with that come the memories. I have so many fond memories of eating cream puffs that my mother made but I didn’t ever make them by myself until I became an adult. They’re one of my favorite treats. And then I started creating my own variations of them. 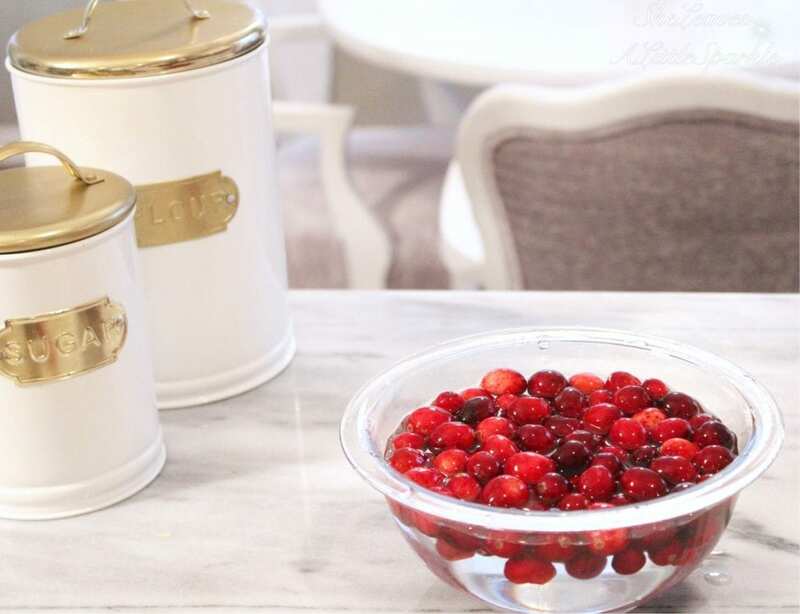 Fun Fact: Years ago, I fell in LOVE with the smell of cranberries and oranges together. I was Christmas shopping at the mall and The Body Shop was burning in the front of the store to lure you in (it worked) with those 2 scents together. It was heavenly. Then I tried putting oranges and cranberries together in desserts and it tasted heavenly also! Yum! I love cranberries at Christmas anyway so it seemed like the perfect combination for this dessert. Cranberries can be tart on their own, but with a sweet orange flavor and a soft vanilla cream…..oh boy….it’s perfection! Now, this “Cream Puffs with Cranberry-Orange Sauce” recipe isn’t difficult, it’s quite simple. However, you MUST follow the directions closely and they will turn out perfectly. And as soon as you make the cream puff once, you’ll want to make them over and over. •Preheat oven to 425°. Lightly grease baking sheets or line with parchment paper (I prefer the latter). •Measure your flour and set it aside. •Bring butter, sugar, salt, and 3/4 cup water to a boil in a 3-qt. saucepan over medium-high heat, stirring occasionally. Immediately remove from heat, and quickly stir in flour mixture all at once. Return to heat and stir with a wooden spoon for 1 to 2 minutes, or until dough is smooth and forms a ball. Transfer dough to the bowl of an electric mixer, and let cool 5 minutes. •Add 3 eggs, 1 at a time, beating until mixture is smooth and glossy. Spoon dough into a pastry bag fitted with a 5/8-inch plain tip. Pipe dough onto prepared pans into 1 1/2-inch rounds (1 1/2 inches high). Smooth out shell peaks with a wet finger. •Whisk together remaining 1 egg and 1 tsp. water. Brush tops of dough with egg mixture. •Bake at 425° for 5 minutes; reduce oven temperature to 375°, and bake 30 minutes or until puffy and golden brown. •Turn oven off; let shells stand in closed oven 10 minutes. This step is VERY important or they will fall quickly if you take them out after the timer sounds. Remove from baking sheets to wire racks, and cool completely. • In medium sauce pan, whisk together 1/2 cup of the sugar, cornstarch and pinch of salt. • Stir in cranberries and fresh orange juice and bring back to a boil over medium heat while continuing to stir. • Reduce heat and simmer about 2 minutes. You’ll hear cranberries “pop”. • Remove from heat and add 1 TBSP of butter and fresh orange zest. •Place the butter in a heat-safe container. Set aside. •Place the vanilla and milk in a medium saucepan. Heat over medium-low until it begins to simmer. •Meanwhile, whisk together the sugar, yolks, and cornstarch. •Temper the hot milk into the egg mixture by whisking in a little bit at a time in order to gradually bring up the temperature of the eggs. Discard the vanilla bean pod. •Return the mixture back to the saucepan and heat over medium-high. •While stirring constantly, bring the mixture up to a boil – the cream will be thick and will “pop” slowly. •Strain the mixture with a mesh sieve and into the container with the butter. Stir to combine. •Press a piece of plastic wrap directly on top of the surface of the cream. Refrigerate until cool and thick. • Cut 1/3 of pastry top off and set aside. • Spoon cranberry-orange sauce onto bottom section of pastry puff. • Add large dollop of vanilla cream. • Replace top 1/3 of pastry puff and sprinkle with powdered sugar. You can also add a tiny dollop of vanilla cream or even whipped cream and a sugared cranberry on top. Enjoy! You can even serve this with Egg Nog or ice cream. 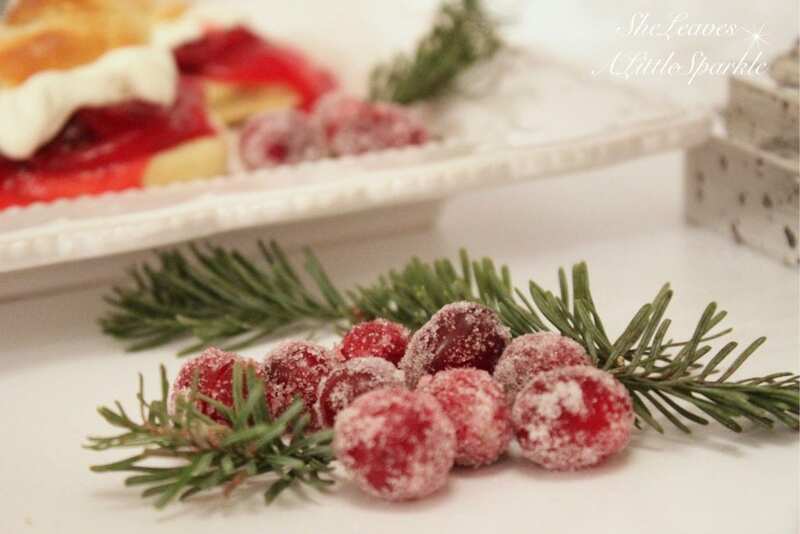 For added garnish, add sugared cranberries and fresh rosemary or pine. Note: For quicker version, vanilla cream can be substituted for instant vanilla pudding. But after you try that vanilla cream, you won’t ever want to pass on that! This is such a fabulous dessert to serve on Christmas Eve or any fun Christmas dinner or party you’re having. 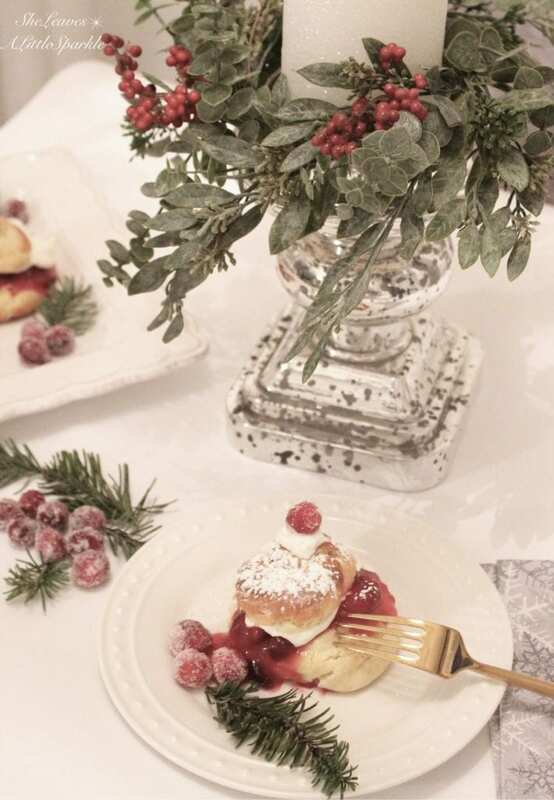 It’s so so pretty, especially with the sugared cranberries! If you make it, be sure to come back and leave me a comment and let me know what you thought! 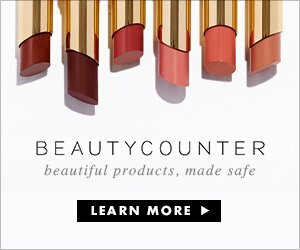 I’d love it if you subscribed to my email list at the top of the page. You can also follow me on Instagram, Facebook and Pinterest to stay in touch and see what I’m up to! Hope to see you back here soon! 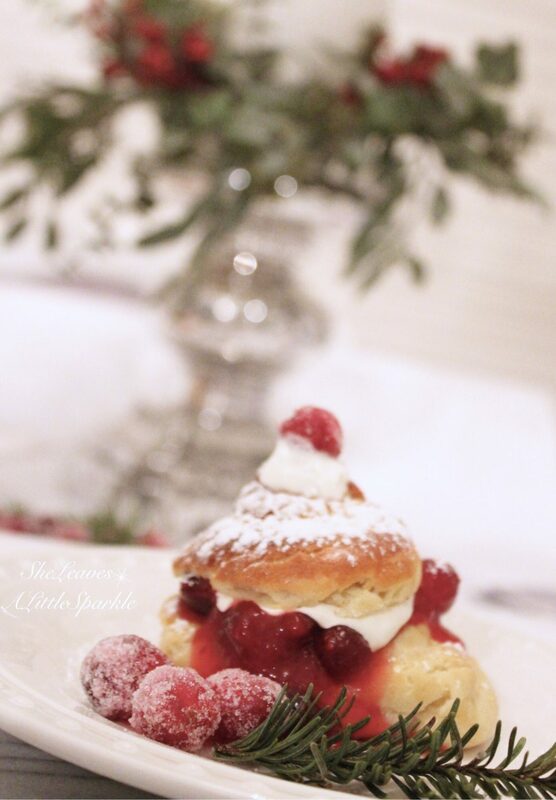 Ok, now while you’re mouth is watering after looking at these Cream Puffs with all that delicious Cranberry-Orange Sauce and Vanilla Cream, please head on over and visit my friend Chloe at Boxwood Avenue because she has something delectable that you don’t want to miss! Don’t forget to pin these recipes (hover over any picture) so that you have them when you head to bake in the kitchen. OH MY GOSH SUMMER these look amazing and love love the pics! So pretty! I am cranberries number one fan;-)! Seriously though Cranberry anything and everything I love! Gotta try these out soon! Thanks for sharing. Aren’t they just so delicious and pretty too? Thank you friend, I can’t wait to make yours! Oh Summer this is just lovely and to pretty to eat. But I’m gonna try this for my Christmas dinner party! I’ve never made cream puff’s but these look incredible! A cranberry orange sauce is the perfect addition too! I am so excited to be on this tour with you, thank you for hosting!! !